‘At the Edge of the Present’ and ‘A Certain Type of Freedom’ are two short films / visual essays on urban coexistence, public space, young people and digital media. They are based on research and fieldwork that BU’s Professor Gerodimos has been carrying out over the last few years, including interviews with architects and public space experts, visual ethnography in 20 cities and media experiments with students. The aim of the research was to understand how we engage with the urban landscape and with each other in public space, and how we can facilitate coexistence in increasingly diverse and dynamic urban communities, including through the use of digital media. The films feature original still photos and video footage from cities across Europe and the US, as well as selected quotations from interviewees, participants and the scholarly literature, all beautifully narrated by actor Sam Booth (The Drowned Man: A Hollywood Fable, Faust). The films are experimental in format and scope, challenging genre boundaries, and aiming to offer a meditative cinematic experience. Combining the format of a visual essay with on-screen referencing and a full soundtrack, the films are also an experiment on merging academic writing with creative content. The aim was to make research accessible to the public, showcasing the occasionally poetic beauty of scholarly writing, but more importantly to encourage a broader audience to reflect on their own relationship to digital media and to the city. 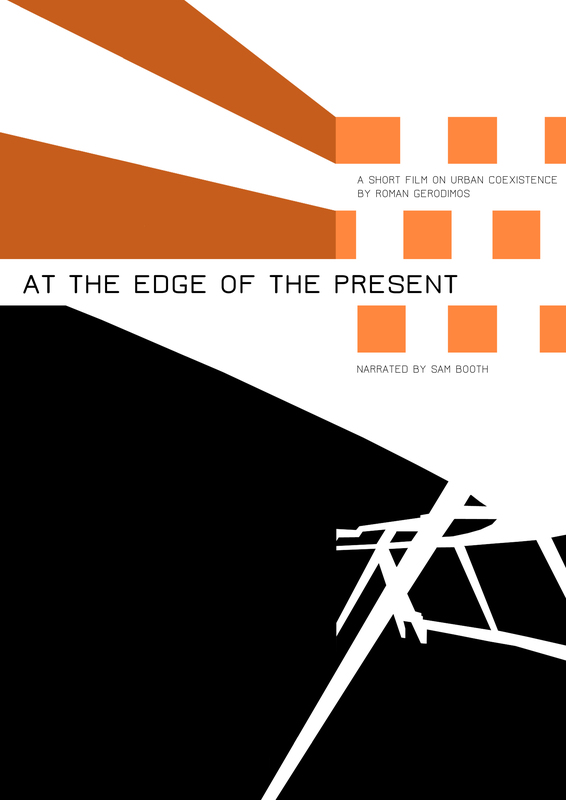 At the Edge of the Present [16 mins] (http://www.romangerodimos.com/films/edge/) looks at the role of urban public space and the challenges facing our engagement with it and with each other. A Certain Type of Freedom [15 mins] (http://www.romangerodimos.com/films/freedom/) looks more specifically at the challenges facing urban youth in public space and the role of digital media in facilitating and hindering engagement with the urban landscape. The two strands of this work – the essay part (research) and the visual part (photography) – initially developed somewhat separately from each other. The inspiration for producing short films actually came when I was transcribing the interviews for one of the research projects. One phrase by Nikos Vatopoulos, a Greek journalist and writer on urban landscapes, was particularly moving and visual and I immediately thought that this should somehow be narrated over visual footage. (That phrase actually ended up opening At the Edge of the Present). The most challenging aspect of the process has been grabbing people’s attention, especially online. In ann online culture of Twitter feeds, gifs and 1-minute cute kitten videos, asking people to sit through a 15-minute film (let alone two!) is not an easy ‘ask’, especially with a tiny budget. However, what’s great is that once people actually make the effort and watch the films they really get into them. Working with Sam Booth was an amazing privilege. I first saw Sam in Punchdrunk’s epic immersive theatre production ‘The Drowned Man’ (https://www.youtube.com/watch?v=liYjdQKQyrc) and, like thousands of other people, I was completely captivated, mesmerised, by his voice. From the moment I decided to do a voice-over for the films I could only think of Sam’s voice, so I asked him and, to my astonishment, he agreed. At the same time, as a big fan of film music, getting to create and mix a soundtrack for my own films was a great experience, despite having to trawl through thousands of tracks online! Even before there was a script or a storyboard, I had a very clear vision about the auditory experience that I wanted the viewer to have, so the moment I finished mixing the soundtrack over Sam’s voice was an unforgettable experience. The films premiered at the Salzburg Academy on Media & Global Change in August and at the European Youth Centre in Budapest in October, and there will be a screening at the Media Education Summit in Boston on November 20th.